These custom made adapters mate a Cardas GRFA female or GRMO male RCA connector to either a female or male XLR. They feature Rhodium and Silver contact surfaces. 9. Noise-Stopper Caps / set of 10 ea. 14. Platinum-Plated Copper XLR Female Caps / set of 2 ea. 15. 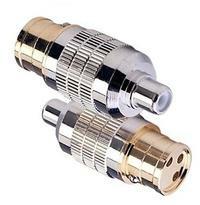 Platinum-Plated Copper XLR Male Caps / set of 2 ea.